Note to consumers: Rainbow flag paint job not standard on the VW bug. It's been a whole year since Erin Davies first discovered the words "UR Gay" and "Fag" scrawled in red spray paint on her VW bug, which was parked near her downtown Albany apartment. After her initial humiliation, Erin became fascinated by people's reactions to the graffiti on the car. 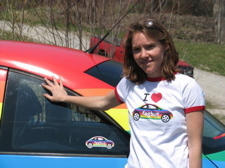 That sparked the idea to drive across the country with the words on the car, and to film the experience in an effort to open up a dialogue and raise awareness of gay rights. She's also spoken at numerous college campuses throughout the year. She says it's very exciting to have made it to the one year mark, following a year filled with ups and downs. After traveling for about two months, Erin began working on compiling the hours of footage she'd collected to turn it into a documentary. She took off from graduate school at Sage to work on the project full time. She's applied for numerous grants, including one from Sundance, to get her film made. Volkswagen gave her $10,000 to use for gas money, car expenses and the film. And they paid for the fagbug's transformation, unveiled last week, on the one-year anniversary of Erin's decision to take the car on a cross-country trip. 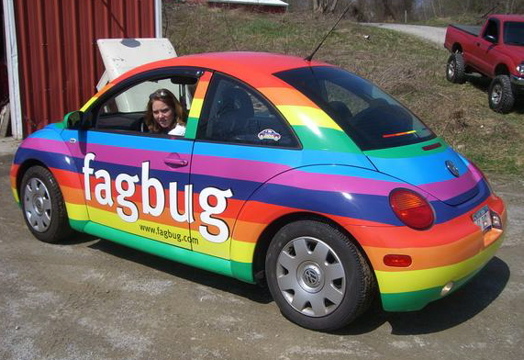 Today the VW is a rainbow flag on wheels, complete with a "Fagbug" logo. Now in the editing process, Erin says she's still learning from the project every day and meeting many people with similar stories. While most of the attention has been positive, driving around in the fagbug has prompted a few negative ones. Someone threw a rock through her car window and through the living room of a Tampa, Florida home she was visiting, and on her 30th birthday earlier this month, someone in Nashville also threw a rock through her window. Erin has also been called "fag" on at least three occasions, and many people have accused her of doing the project just for personal profit, which she says couldn't be farther from the truth. While she's the face of the project, she says it transcends far beyond her own story by encouraging other people to think about their own lives and to learn from what she's doing. "It's personal, but it's also an experience for others to see. It's a journey," she said. "People don't have to care about me personally, or my feelings or any of that, but the point is this journey I've taken and just how most people have never really seen this kind of thing before." Erin expects to finish the feature-length film over the next two months, and plans to pitch it to film festivals in the fall. While she said she knows she's raised a lot of awareness this year, there's one other person that she hopes will hear her story: the person who vandalized her car. "I really want to be able to reach them," she said. "I want to be able to communicate back." Check it out at www.fagbug.com. You go girl! I mean, woman. You know, after the disaster that was Volkswagen's lack of corporate responsibility and the lemon they sold me, I was going to write them off as a company that didn't deserve consumer support. This almost changes my mind. Still, three cheers for Erin! This takes a lot of strength. Wow, I can't believe it's been a year already. Thanks for the update. That fag bug sure kicks the crap out of my 1995 Ford Aerostar. And that's even considering the fact that I have a plush Garfield suction cupped to the back window, which I think we can all agree makes it the epitome of hipness. There's a recent profile of Erin in a Vanity Fair blog called Stick Shift. Live and work in Ocean Pines. Saw your car. Was going to take a pic, but didn't want to be rude. Will ck out the flic when it comes out. I saw your car today on Highway 80 heading east out of Columbus, GA. I was the lady waving at you while you talked on the phone. I pray you have a safe trip home. Blessings to you Erin. You are an inspiration. Saw your car in Cincinnati, Ohio in June of 2014. Very cool! Looked you up to se what the scoop was! Safe travels.